Beijing’s workplaces are still “disaster zones” for illegal smoking, three years after the Chinese capital banned smoking in all public indoor spaces, according to a recent report. The number of complaints about illegal smoking in China’s capital has risen, the government-linked Beijing Tobacco Control Association (BTCA) said in a report published last week. BTCA received 2,265 complaints from Aug. 1 to Sept. 30 through its WeChat account, a 4.9% increase from the same period last year, the report said. Beijing Youth Political College was one of the worst offenders, with 54 public smoking complaints involving the college being made within the first few days of the current semester, which began in September. The Beijing division of the Chinese Football Association Super League was also named as an illegal smoking hotspot in the report. While most complaints from the public were about people smoking on premises, some were about the absence of clear no-smoking signs on the premises and a lack of enforcement of no-smoking rules, the report said. Beijing banned smoking in all public indoor spaces and on public transportation in June 2015, when it rolled out what was hailed at that time as the strictest smoking control ordinance in China’s history. 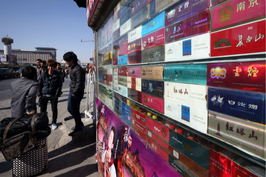 Since then, the managers of 21,236 sites in the capital have been fined a total of nearly 5.5 million yuan ($794,000) for failing to comply with the ordinance, and 8,883 people have been fined over 465,000 yuan in total for illegal smoking, according to the BTCA report. The total value of fines meted out has also increased this year, with 2,723 people being fined a total of 143,600 yuan from January to September — 27% more people and 30% more money than in the same period last year, according to figures released by the Beijing Health Inspection Institute Thursday. The BTCA attributed the increase in complaints to better enforcement of the tobacco control law. But problems like unclear management responsibilities and poor regulation of sites remain, it said. 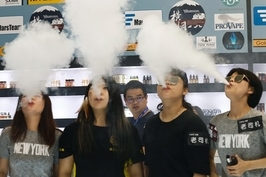 The BTCA also highlighted the emerging problem of electronic cigarettes, saying the next step for tobacco control in Beijing will be to conduct more research on the harmful effects of so-called e-cigarettes, while looking into the possibility of prohibiting their use in public places. 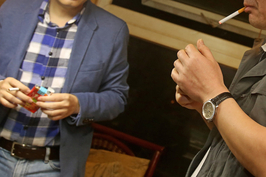 China’s persistent public smoking problem has prompted calls for stricter measures. A recent editorial published in the Beijing Youth Daily suggested that illegal smoking could be included in citizens’ credit ratings, while some anti-smoking advocates have also suggested increasing taxes on tobacco to curb China’s smoking habit.